This blog post describes the synchronization of Android smart phones to own hosted groupware suite for calendar, contacts and e-mail as a first step. How to “free” your Android smart phone is not focus of this post: The FSFE (Free Software Foundation Europe) provides the project “Free Your Android”. I’ll discuss some points of getting “freeing” Android phones in another blog post following in a few weeks. An Android smart phone (it’s not necessary to root it). A server running your private groupware suite for CalDAV/CardDAV connection. Access to your contacts and calendar data on the cloud service with export functionality. I’ll use SOGo as groupware suite on a vserver running Debian. You could easy integrate an already installed IMAP server etc. as e-mail backend. For session handling and storage SOGo uses a SQL database. 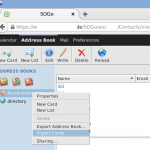 The web GUI of SOGo provides a clear interface for accessing e.g. e-mails, address book and calendar. The first step of getting Google-Free we need to export the contacts and calendar entries and remove them. First log into your Google Account and start Gmail. Access your contacts and go to “more” and select “Export”. On the “Export Contacts” pop up select “All contacts” and choose “vCard format”. Then click “Export”. Store the contacts.vcf on your local machine for later import into your groupware suit. After successful export you may want to delete all your contacts from your Google Account. In a second step, start the Google Calendar and select the calendar you want to export. Click on the arrow and select “calendar settings”. Go to the “private address”, click on “ICAL” and download the ical file for later groupware import. 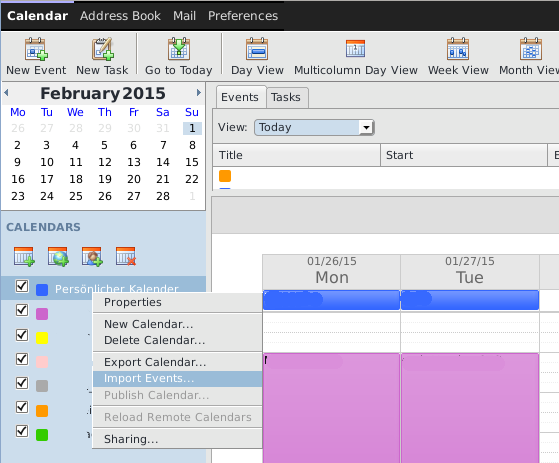 After successful export you may want to delete the calendar or all contents on the same page. Now it’s time to import your data into your private owned system. 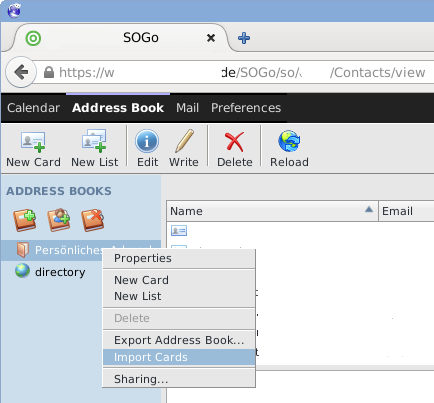 SOGo supports importing via the web GUI: Log into your SOGo Account and just import the contacts and calendar events into you existing personal address book and calendar. Right click on the calendar or address book and choose “Import Cards” / “Import Events”. After successful import you could access the data inside SOGo. 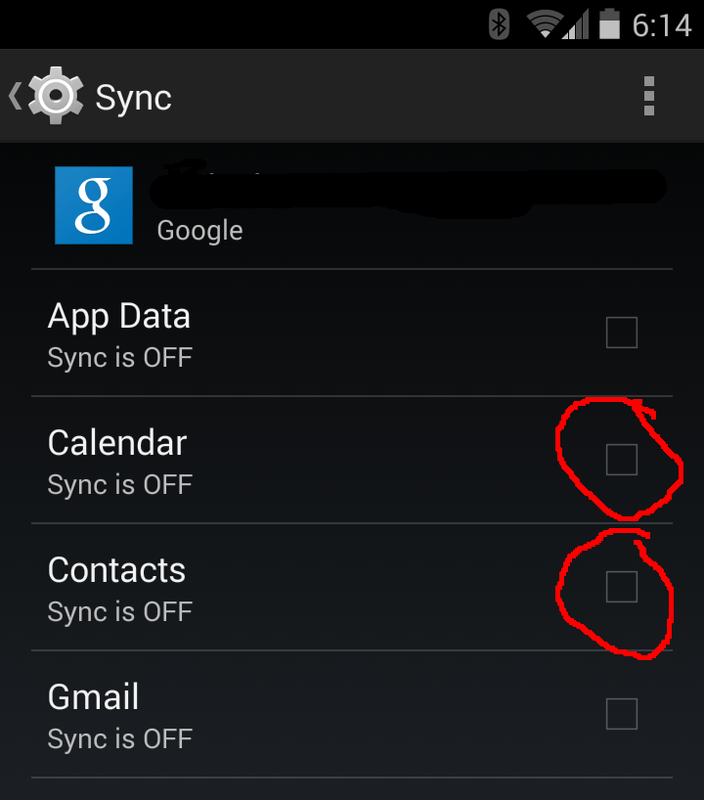 This step is only necessary, if you use Google to sync your calendar and contacts to prevent unwanted sync of your private data. Go to Settings and Accounts and remove the Google account or switch off at least the synchronization of Contacts and Calendar. Unfortunately Android doesn’t support DavCAL out of the box. You first need to install a CalDAV/CardDAV App which supports syncing of contacts and calendar events. I use DavDroid. It’s open source and available over the F-Droid (for free) or Google Play (costs about EUR 2,99). That’s all. 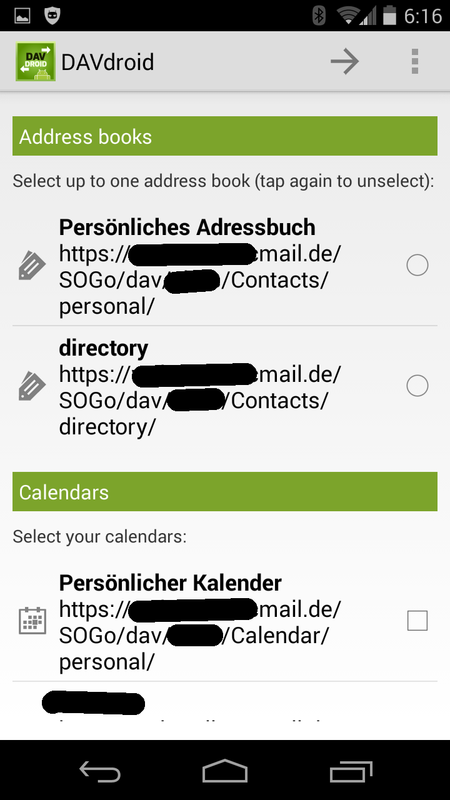 DavDroid starts to sync the data and you could use them as usually inside your favorite calendar and contacts app. And there is no disadvantage using your own system for synchronizing the data instead of Google. You’ll get back the ownership and control of your data. CalDAV/CardDAV is a (mostly) standardized protocol. 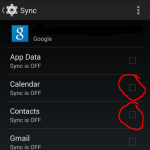 Adding synchronization is easy to set up and integrate into Android. You don’t need to root your Android – it works with the stock ROM. Customized ROMs like CyanogenMod, Replicant or OmniROM use the same setup. 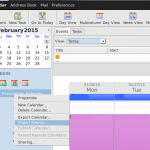 You could also use CalDAV/CardDAV synchronization on your pc desktop applications. 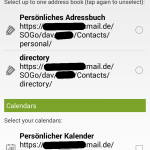 You need a third party software for CalDAV/CardDAV synchronization on Android. The security of the server is your own responsibility. Alternately you could use a different CalDAV/CardDAV service.